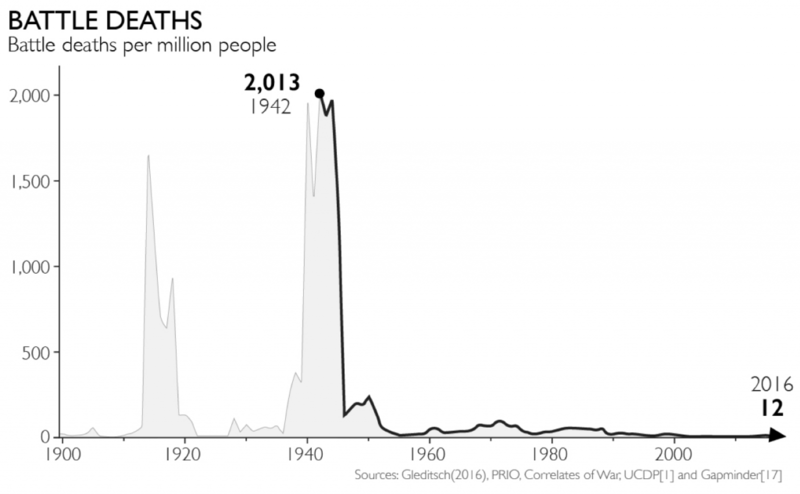 The figure of 65 million World War II deaths includes all deaths and comes from White[1, 2]. The data sources for battle deaths (Correlates of War project, Gleditsch, PRIO and UCDP) include reported deaths of civilians and soldiers during battle, but not indirect deaths like those from starvation. Estimates of fatalities in Syria are from UCDP. We strongly recommend watching this interactive data-driven documentary, which puts all known wars in perspective: www.fallen.io. To interactively compare fatalities in wars since 1990, go to http://ucdp .uu.se.